This is the most time I have ever spent making a bowl of soup! Was it worth the effort? Well it tasted mighty fine and I can now cross it off my bucket list of classic recipes to try before I die. Would I make it again? Honestly? Not for a very long time, no. I’m about as far from being a classic cook as you can get. I’m girl in a hurry, with a bazillion things to do in a day that often just wants dinner to magically appear on the table when I’m ready to sit down and eat. And if I’m tired, all I want for tea is a plate of buttered toast. Marmite optional. So to go to the lengths involved in making a proper French Onion soup, from browning the beef bones for the stock, to sweating down those onions is not something I plan to indulge in again any time soon. That said, if you have more patience than me or this classic soup is on your recipe bucket list, then here’s how you go about it. Place the bones in a large roasting tin and cook for an hour. Halfway through, ladle the pan juices over the bones to help them colour nicely. Pop the bones into a large stock pot, and pour over all those lovely juices too. Season well with salt & pepper and just cover with cold water. Bring to the boil and immediately turn the heat down to low and very gently simmer for 4-5 hours. Skim off any scum during cooking as necessary. When the time is up, remove the bones & strain the liquid into a large jug or pan. Let cool to room temperature before popping in the fridge overnight. The next morning, the fat will have solidified and be easy to remove. You'll be left with a big bowl of jellied meaty stock for which you'll need 1 litre to make the soup and the rest can be frozen for another day. Melt the fat or butter in a large pan until very hot. Add the onions, garlic & sugar and cook on high for about 5 minutes, or until the onions are colouring nicely. Turn the heat right down low and cook for a further 30-40 minutes. Next pour in the stock and the wine and season well with salt & pepper. Bring to the boil and immediately turn the heat down to a gentle simmer and leave for 1 more hour. Yep, I told you this was time consuming! Serve with cheese on toast or cheesy croutons if you are a lactose happy traditionalist or a good quality bread toasted if not. Either way it'll be yummy, and even yummier the following day. Wow, that is one long cooking process, Janie. Mine doesn’t take that long at all… yours looks delicious though. Hats off to you for making this amazing soup! It’s been on my to do list for years, but still haven’t got around to it. Yours does look worth the effort though, so yes when I have a free day I might just have to give it a go. I make a veggie version of this and love it. Just with regular vegetable stock Nayna? Love your honesty about time consuming recipes. This one might be something I eat at a restaurant. Well done, bet it was delicious. But the question is, girl in a hurry. … was it worth it? Err, ummm, yes. Purely because I’ve done it! It was very tasty, but life is way to short to be spending 9 hours on a bowl of soup right?! YES YES YES! 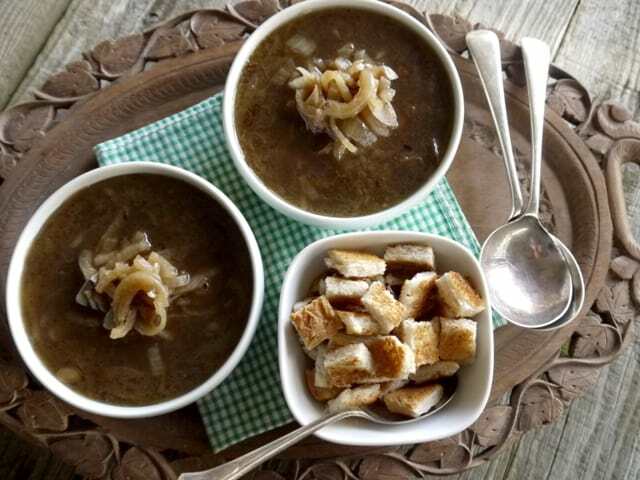 J’adore French Onion Soup and that looks FABULOUS! Wow! That soup looks amazing. 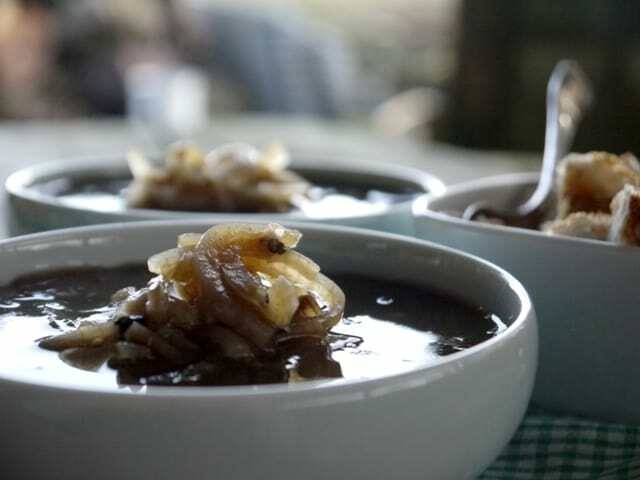 I know it is a long process, but you must have been so satisfied once you tackled the task of stock making and sweating onions, to end up with a delicious bowl of soup. I have always cheated and used ready made stocks, but the taste is not the same. For me a steaming bowl of onion soup and a chunky cheesy sourdough toast is heavenly. It is def on my to do list, just need to find some free time! And i now know who to come to for advice. Agreed nine hours is a pretty long time for a bowl of soup, but a good french onion soup is divine and yours certainly looks it! I made a really fabulous one a few years ago in about three hours (admittedly it wasn’t The Classic!) but cannot recall where I got the recipe from. Been meaning to have a crack at one for the last few weeks as I’m fed up of watching my mountain of spare onions from my veg boxes grow week on week! I’m convinced you could make a MUCH quicker version, perhaps I’ll give it a go next week as it was a fine bowl of soup! WOW that really is quite some cooking time, but I bet the flavour was incredible! Looks delicious but I see what you mean about the time! Not a dish for a spontaneous moment, Since I can’t do cheese I won’t be tempted but you make it look gorgeous. I can just about smell it from here. No, definitely no spontaneity here! But the taste is worth it!